2018 RAHS CONFERENCE – Port Macquarie – Camden Area Family History Society Inc. Bookings are now open for our 2018 Conference: Surveying the Past, Mapping the Present at the Westport Club in Port Macquarie. The 2018 RAHS Conference is a wonderful opportunity to learn more about Port Macquarie, with local historians speaking about the experiences of the Birpai people, life on the early estates in the Hastings, and Port Macquarie’s last convicts. Our keynote speaker is Dr Mathew Trinca, Director of the National Museum of Australia, who will discuss the very pertinent theme of ‘History from the ground up’. 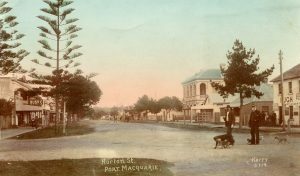 This guided walking tour ofPort Macquarie’s Second Burying Ground will explore the stories of Port Macquarie’s famous and infamous residents. This bus tour will provide an overview of Port Macquarie’s historic sites, maritime history and convict past. Step back in time on this guided tour of the extensiveruins of a grand country mansion built by convict labour in the 1830s. The pneumonic influenza or ‘Spanish flu’ pandemic that circled the world in 1918–19 left few communities untouched. In this practical workshop, we review the bigger picture of the pandemic before considering how its impact might be commemorated locally. To learn more about our Conference, including transport and accommodation, Port Macquarie’s history and things to see and do, visit our Conference webpage.